To boldly go… and not get thirsty along the way! This BPA-free, reusable, and recyclable Star Trek 32 oz. 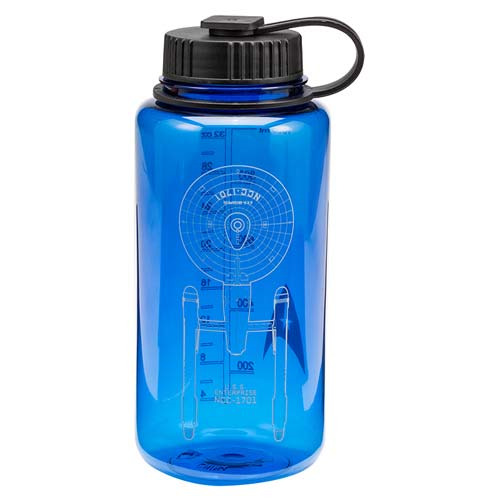 Tritan Water Bottle features a bold and bright design that includes a see-through image that shows a line diagram of the U.S.S. Enterprise on one side and the Star Trek delta on the other. The leak-proof loop-top cap offers greater functionality, the wide mouth makes it easy to clean and add ice, and measurement marks help track your daily intake. This 8 1/4-inch tall bottle is made from durable Eastman Tritan plastic. Hand wash only. Not dishwasher safe. Do not microwave. Ages 13 and up.